Eric Bledsoe – File Photo / Copyright 2019 NBAE (Photo by Nathaniel S. Butler/NBAE via Getty Images). After losing by 35 points in the series opener, the Detroit Pistons put up a bigger battle in game two, but in the end, the Milwaukee Bucks pulled out a 120-99 win to take a 2-0 lead in their opening round Eastern Conference playoff series. The Pistons took a one-point lead (59-58) into the locker room at halftime, but The Bucks turned up the heat defensively and dominated the third quarter to pull away. Giannis Antetokounmpo scored the first seven points of the third quarter for the Bucks and they outscored the Pistons 35-17 in the period to once again take control. Eric Bledsoe had 27 points to lead the Bucks. Giannis Antetokounmpo had 26 points and 12 rebounds. Khris Middleton added 24 and Pat Connaughton came off the bench to score 18 points and pull down nine rebounds. Andre Drummond had 18 points and 16 rebounds for the Pistons, who will host game three of the series on Saturday in Detroit. 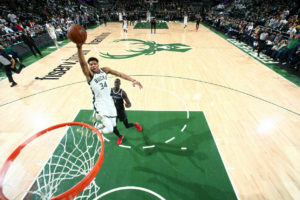 The Milwaukee Bucks swept their four-game series against Detroit during the regular season and their dominance against the Pistons continued into the post-season. The Bucks grabbed game one of their best-of-seven series 121-86 at Fiserv Forum on Sunday night. Giannis Antetokounmpo had 24 points and 17 assists in just 23 minutes to lead the Bucks. In all, seven Bucks scored in double figures. Eric Bledsoe had 15 points, Khris Middleton and Brook Lopez added 14 each. With the Bucks blowing out the Pistons, it meant coach Mike Budenholzer was able to keep the minutes down for his starters. In fact, reserve Pat Connaughton played the most minutes (28). Brook Lopez – (Photo by Nathaniel S. Butler/NBAE via Getty Images). The Milwaukee Bucks played Tuesday night without Giannis Antetokounmpo, but held off the Los Angeles Lakers 115-101 at Fiserv Forum. It helped that the Lakers played without their star, Lebron James. Stepping up without Giannis, Khris Middleton led the way with 30 points. 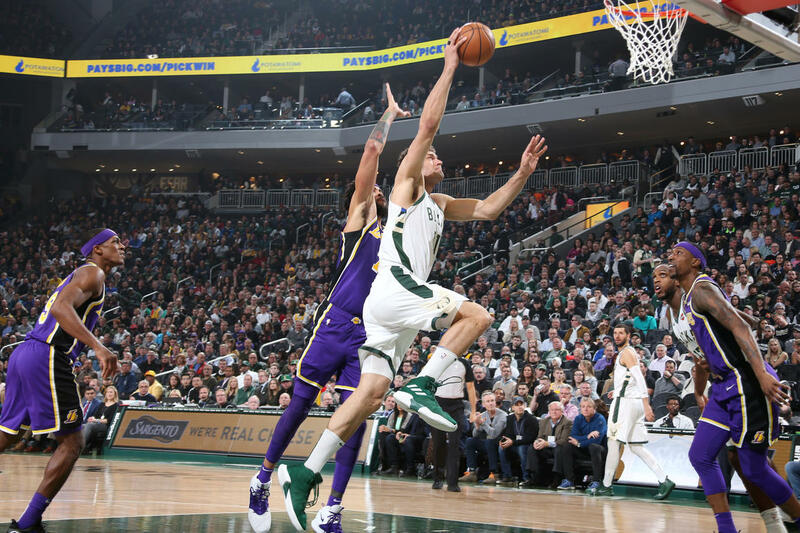 Brook Lopez added a season high 28 and Nikola Mirotic added 23 points as the three front-line starters combined for 81 of the Bucks 115 points. Kentavious Caldwell-Pope poured in 35 for the Lakers. 21 of the 35 came in the second quarter. Playing the second game in two nights, the Milwaukee Bucks ran out of gas in the second half and fell to the San Antonio Spurs 121-114 in San Antonio. The Bucks jumped on the Spurs early and led by as many as 15 points in the first half. Eric Bledsoe, who finished with 21 points, hit his first four shots to get the Bucks going from the start. The Bucks had their largest lead at 32-17 when Pau Gasol hit a three. But the Spurs went on a 11-0 run and trailed 60-54 at halftime. LaMarcus Aldridge had 29 points and DeMar DeRozan 28 for the Spurs, who opened the third quarter on a 17-4 run to take the lead. The Bucks would lead briefly one more time but the Spurs owned the second half to pull out the win. Giannis Antetokounmpo led the Bucks with 27 points and 13 rebounds. Khris Middleton added 15 and Pat Connaughton added 14 off the bench. The Bucks are off today and return to action at New Orleans on Tuesday night. Playing without star Giannis Antetokounmpo, the Milwaukee Bucks opened a five-game road trip with a 117-106 win over the Chicago Bulls at the United Center on Monday night. Antetokounmpo was held out because of a sore right knee. The Bucks were also without guards George Hill and Sterling Brown as well, but Khris Middleton and Malcolm Brogdon led the way with 22 points each. The effort gave the Bucks their 5th straight win and 8th straight road victory. 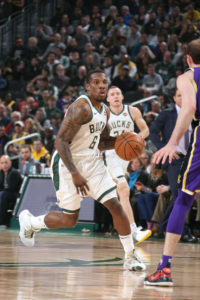 The Milwaukee Bucks played without Malcolm Brogdon (chest) and Sterling Brown (wrist), but they still prevailed in Detroit, beating the Pistons 115-105 on Tuesday night. Pat Connaughton, after playing in just eight of the last 23 games, came to the rescue. Connaughton hit 7 of 8 from the field and scored 16 points as the Bucks pulled off a sweep of the Pistons for the first time in franchise history. Giannis Antetokounmpo had 21 points, 11 assists and eight rebounds to lead the Bucks. Eric Bledsoe added 10 points as the Bucks improved to 13-0 in games following a loss. They’re 36-13 on the season. They’re 36-13 overall. With Detroit trying to chip away in the fourth quarter, Eric Bledsoe scored 13 of his 20 points in the final frame. The Bucks are off until Friday when they take on the Toronto Raptors in a battle for the best mark in the Eastern Conference at Scotiabank Arena. The Milwaukee Bucks started fast, faltered in the middle and finished strong. But the hole was too big to dig out of, falling to the Charlotte Hornets 110-107 in Charlotte on Monday night. The Bucks built an early 14-point lead after making 8 of their first 10 three-pointers. From that point, the Bucks found it difficult to score, both inside and outside. Charlotte was filling the paint with defenders, trying to prevent Eastern Conference Player of the Week Giannis Antetokounmpo from making a big impact. 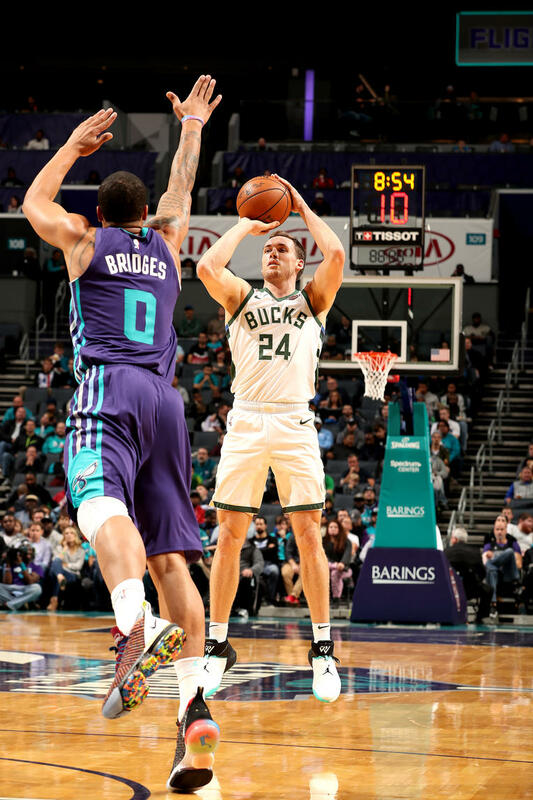 Charlotte’s defensive effort turned a 14-point deficit into a 13-point on the Bucks at halftime. The lead grew to 25 in the third quarter before the Bucks started their comeback rally. Defensively, the Bucks employed a switching defense, something they haven’t done much of this season, and it worked. The Bucks were able to cut the 25-point deficit to 13 after three-quarters. The comeback continued in the fourth quarter, thanks to the work of reserves Pat Connaughton (15 points) and Donte DiVincenzo (8 points in 11 minutes). Milwaukee climbed all the way back to a one-point deficit but Charlotte held the Bucks off from there. Giannis Antetokounmpo had 20 points, 13 rebounds and nine assists to lead the Bucks. Milwaukee dropped to 14-6 and will return to Milwaukee to host the Chicago Bulls at Fiserv Forum on Wednesday night.